While returning from a distant union mission aboard a racing car computer, William Davis is the victim of a strange failure in the heart of a vast expanse of desert. Trivial at first glance, the incident will soon take a more dramatic turn, Davis Faisat a kind of modern Robinson lost at the margins of the world, in an environment that does not include … the backdrop of futuristic transport and clashes for energy management (a prescient theme), a fable disenchanted carried by a masterful design. No longer available. 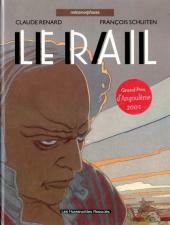 Le Rail is part of the Metamorphoses album.